In a press release today, The Maine Association of Realtors reports Maine home sales decreased 30.07% in July 2010 compared with July 2009. The decrease was anticipated, reflective of the end of the federal tax credit which had created an accelerated demand to go under contract by a specific date. National home sales figures show a 25.6% decrease in that same time period, and the Northeast a 30.03% decrease. However, Maine median home sales prices are still increasing. The median sales price rose 4.23% to $172,500 in July 2010, compared with July 2009. Median indicates half sold for more and half for less. How else to explain the First Family's visit this weekend to often-overlooked Acadia National Park, Maine's spectacular contribution to the nation's national park system? Its rocky shores and rising mountains might not be as dramatic as Yellowstone or Yosemite, but it's a photographer's dream. The president, first lady Michelle Obama and daughters Malia and Sasha will jet there around noon today for two nights away from Washington's heat -- and heated politics. As they prepared to leave, temperatures in the nation's humid capital were headed well into the 90s, with a heat index of 105. •Drive the 20-mile Park Loop Road, stopping frequently for snapshots. •Check out Sand Beach and its bracing waters. •Pause frequently in search of whales. •Climb at least part of Cadillac Mountain, the East's tallest. •Dine on blueberry pancakes in the morning and fresh lobster in the evening. That is, if the Obamas are lucky enough to have two uninterrupted days. That hasn't happened much on their family outings. SOUTH PORTLAND (May 24, 2010) - Sales of Maine single-family existing homes rose 62.95 percentin April 2010 compared with April 2009.
that half of the homes were sold for more and half sold for less. The end of the federal home buyer tax credit contributed to strong sales figures in April 2010. The National Association of Realtors (NAR) reports a 20.5 percent nationwide increase in singlefamilyhome sales in the same time period. The national MSP rose 4percent to $173,400 in April.In the regional Northeast, sales were up 41.6 percent and the MSP of $243,000 reflects an increase of2.1 percent. SOUTH PORTLAND (April 22, 2010)— Maine is showing positive growth in both unit sales and the median sales price of single-family existing homes during the month of March 2010. According to the Maine Real Estate Information System, Inc. (MREIS), 815 homes sold last month—a gain of 46.06 percent compared to March 2009. The median sales price reached $164,900, up 9.93 percent from March 2009’s price of $150,000. The median sales price indicates that half of the homes were sold for more and half sold for less. Alan Peoples of Coldwell Banker Residential Brokerage in Portland relays, “The economic numbers for March and the rolling quarter are strongly positive and April is likely to be more of the same. These numbers reflect momentum from the first time and repeat buyer tax credit programs, which end at the end of April.” The increase in the median home sales price shows increased sales of higher priced homes in Maine from the same time period in 2009. 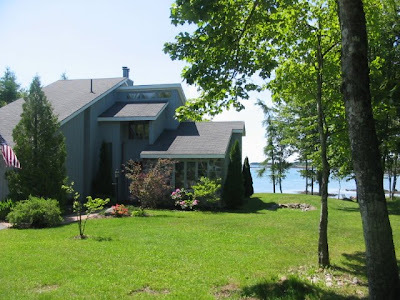 For more information on Maine waterfront real estate, go to www.WaterfrontPropertiesOfMaine.com. These days, of course, as the Great Recession reels on, some homeowners might prefer not to know the current valuation of their homes. But our survey of Maine properties sold over the past year proves that they might be missing out on the best opportunity since, well, you could buy a magazine for less than five bucks. Although the median sales price of single-family homes in Maine declined nearly 9 percent last year to $164,000, the number of homes sold jumped by 10 percent. Maine beat the national statistics on both counts — total sales increased just 5 percent nationwide, and median sales price dropped 12 percent. In a state as enormous as Maine, of course, where you decide to buy will have a huge impact on how much your budget will get you. In Piscataquis County, for instance, where the median sales price dropped 21 percent last year, you might be able to afford a couple of hundred acres and a stunning farmhouse. Dream of moving to coastal Knox County, though, where prices dropped just 3 percent, and that same money will see you in a much more modest home. And if your needs have you searching on the water someplace farther south, like York, you could have to shell out more than eight hundred dollars per square foot — nearly ten times what you might pay in Aroostook County. Indeed, the Maine way of life seems to be the most important market condition for both buyers and sellers. And deal or no deal, boom or bust, isn’t that the name of the game when it comes to buying or selling real estate in Maine? SOUTH PORTLAND (March 23, 2010)— The median sales price of existing single-family homes in Maine remained unchanged during the month of February 2010 compared with February 2009, according to the Maine Real Estate Information System, Inc. While home sales increased by double digits (14.09 percent) in February 2010, the median sales price of $158,000 is the same as one year ago. The median sales price indicates that half of the homes were sold for more and half sold for less. According to the National Association of Realtors (NAR), existing home sales nationwide rose 4.3 percent in February 2010 compared to one year ago. The national median sales price for those homes dipped 2.1 percent to $164,300. Regionally, sales in the Northeast were up 12 percent and the regional median sales price increased 7.5 percent to $254,700. To complete a search as described in this video, go to www.WaterfrontPropertiesOfMaine.com and click on "Customized Property Search"
The program providing first-time home buyers a tax credit of $8,000 has been extended to April 30, 2010 and expanded to allow for existing home owners who have been in their home for at least 5 years of the last 8 years to receive a $6,500 tax credit if they purchase a new primary residence. * Buyer must be someone who has not owned a home during the 3 year period prior to purchase. * The tax credit does not have to be repaid unless the home is sold or ceases to be used as the buyer’ principal residence within 3 years after the initial purchase. * The tax credit applies only to homes priced at $800,000 or less. * The tax credit applies to sales occurring after 1/1/2009 and on or before 4/30/2010. However, in cases where a binding sales contract is signed by 4/30/2010, a home purchased by 6/30/2010 will qualify. * For homes purchased after 11/6/2009 and on or before 4/30/2010, income limits are $125,000 for single taxpayers and $225,000 for married couples filing jointly for the full tax credit. * Buyer must have owned and lived in their previous home for 5 consecutive years out of the last 8 years. * The tax credit does not have to be repaid unless the home is sold or ceases to be used as the buyer’s principal residence within 3 years after the initial purchase. * The tax credit is equal to 10% of the home’s purchase price up to a maximum of $6,500. * The credit is available for homes purchased after 11/6/2009 and on or before 4/30/2010. However, where a binding sales contract is signed by 4/30/2010, the purchase qualifies if it is completed by 6/30/2010. * Single taxpayers with incomes up to $125,000 and married couples with incomes up to $225,000 qualify for the full tax credit. While home prices in some U.S. markets increased 15-20% annually in the early 2000’s, Maine prices went up around 5% annually. In our cyclical real estate market, what goes up must eventually come down a bit, soMaine didn’t have as far to fall. The market re-set here about 20-25% below its peak in 2006. In line with the national upward trend, Portland, Maine median sold home prices for the 5 months starting in July were 207k, 198k, 204k, 200k, and 212k respectively. Volume on the other hand has been way up for this area. So it now seems we have found the approximate bottom of the real estate market, with prices firming up and sellers refusing to go lower than 25% from the peak in 2006 to move their property now.. In short, we are cautiously optimistic that 2010 will be a year of healthy sales volume, as there is a large inventory to choose from, and borrowing costs are as low as they will be for a long time to come. New Year’s 2010 looks a whole lot more positive for real estate and housing than things did last year at this time. The out look right now is a complete contrast -- home sales have been rising for several months, thanks in part to the federal tax credit programs, new home starts and permits are up in most parts of the country, and prices are generally trending up in most of the markets that got shell-shocked in the bust. • 2010 will continue to be an optimum buyer’s market, where those in a position to purchase will continue to receive and negotiate optimum deals. • Mortgage interest rates are projected to move up from just over 5% for 30 year loans to 6% by late 2010. Hi folks. My name is Les Taylor. I have been a real estate broker since 1983. For 17 of those 29 years, I was a broker in the Napa Valley wine country, north of San Francisco, co-founding Beck & Taylor Realty, which is still in business there, today. My wife, Sallie, attended college in Maine. After spending several vacations in Maine, we decide to move here, along with our children, Samantha and Michael -- for a one-year experiment in the summer of 2000. Being taken with Maine's coast and lakes, I decided to specialize in waterfront property. Discovering the sign at the border "Maine: the way life should be" is more than just a slogan, it seems the experiment has become permanent. 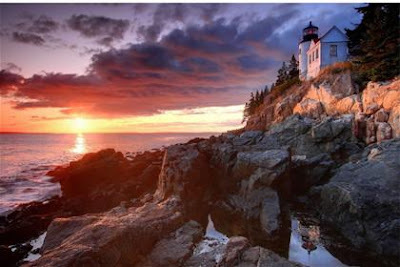 My company, Waterfront Properties of Maine is located near the village of Union, which is in just about the geographical center of the midcoast region. 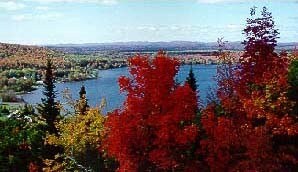 Union is surrounded by many lakes and rivers, and the coast is just a few minutes away. If you are in the area, please feel welcome to stop by for a visit. There is usually a pot of coffee brewing and, in chilly weather, a cozy fire burning in the fireplace.